Honey Cake with "First Fruits" following tradition. For Rosh Hashanah Dessert, the first thing that springs to mind is Honey Cake, of course. But how many disappointing honey cakes have we all had? Lots, right? They look pretty enough, sure, but the dry, tasteless cake rarely lives up to it's reputation. 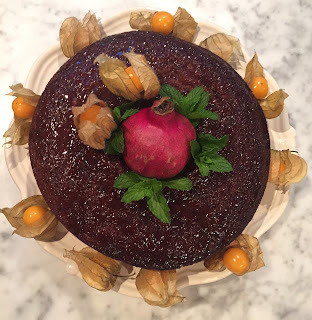 But ever on the hunt to perfect the "golden oldies", I tried once again, and I do believe that this honey cake, served with a garnish of Italian Plums in salted-caramel-thyme glaze might be the retro-modern kind of dessert that we can all stand behind. Feel free to garnish with a dollop of creme fraiche, or thick Greek Yogurt. Fits in three loaf pans, two 9-inch square or round cake pans, one 9 or 10 inch tube or bundt pan, or one 9 by 13 inch sheet cake. Or use one of my favorite disposable (non aluminum) baking pans available here- these are amazing to have on hand especially if you often bake and bring, as I do. Spoon batter into prepared pan(s). Sprinkle top of cake(s) evenly with almonds, if using. Place cake pan(s) on two baking sheets, stacked together (this will ensure the cakes bake evenly- otherwise the bottom will overbrown due to the high sugar content. DO NOT OVERFILL THE PANS, MAKE SURE YOU LEAVE AT LEAST 1/2 INCH FOR RISING. Bake until cake tests done, that is, it springs back when you gently touch the cake center. For LARGE angel and tube cake pans, this will take 60 to 75 minutes, loaf cakes, about 45 to 55 minutes. For sheet style cakes, baking time is 40 to 45 minutes. Set timer for minimum time, and keep an eye on them. Stir Sugar, honey, margarine, salt and thyme together in large ovenproof nonstick skillet over high heat until butter melts. Cook 2 minutes, stirring constantly (mixture will bubble vigorously). Add plum halves, cut side down. Cook plums without stirring for 2 minutes. Turn plums over and transfer skillet to oven. Roast until caramel is deep brown, checking frequently to prevent burning, about 4 minutes. Divide among dessert plates, spooning caramel over, leaving thyme behind. Serve with Honey Cake, or crème fraîche, or Greek Yogurt.